It's no surprise that your quality of life has a lot to do with quality of sleep. But if you suffer from allergies, a good night's rest can be hard to come by. Fortunately, it doesn't have to be. The secret is our Pristine® dust mite allergen barrier covers for your mattress, box spring, pillows and comforter. This advanced line of dust mite covers create an impenetrable barrier between you and the irritants that get in the way of restful sleep. 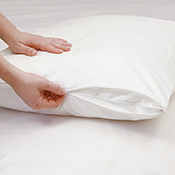 The patented fabric technology features a small pore size of 5.7 microns that keeps allergens out of your bedding. Pristine fabric is soft, breathable and strong enough to withstand repeated washings without losing effectiveness. Made in the USA.